In this post, Lisa from @fjordsandbeaches shares her experience and memories from the Bali retreat in March 2018! I first heard about Pangea Dreams in Spring 2017, when one of my favourite Instagrammers, @katgaskin, went on the Nicaragua retreat. I was intrigued, and spent ages watching her stories and seeing all these lucky women learn and explore in paradise, finding new accounts to follow, and thinking that this looked like such an epic time! I quickly started following Pangea Dreams, and made sure I was on the email list, hoping that maybe one day I would go on those retreats. This was around the same time that I started working towards my goal of becoming a full-time travel blogger, and I spent the next few months watching the Pangea Dreams community grow, and spending every waking hour building my blog and business. By autumn, I handed in my notice, and started planning my 2018 adventures! I really wanted to spend some time in Bali after having heard so much about it from other travel bloggers and digital nomads. So I booked myself a one way ticket the week after leaving my job in February 2018. I spent the rest of the autumn and winter preparing for my big move, and trying not to worry whether I had made the right decision or not. Then I got an email from Pangea Dreams! My heart stopped! Bali in March. I was gonna be in Bali in March! I felt like this had to be a sign, as I had been growing more and more determined to join a Pangea Dreams retreat in the months that had passed since I first discovered them. I quickly scribbled a reply asking to be kept in the loop on the Bali retreat, assuming that it was too early to sign up and that the exact dates surely couldn’t be decided yet. But they were, and I got a super exciting reply with all the details I needed to make my decision! This didn’t take me long, and I asked to secure my spot immediately. I was so excited, and couldn’t believe the timing! I would leave my 9-5, spend a month working on my blog and enjoying the sun in Bali, before joining the Pangea Dreams retreat in Ubud! I was ready to learn ALL the skills I needed to run my online business, perfect my photography skills, and really take Fjords and Beaches to the next level. We are heading back to Bali in October for another retreat! JOIN US! The Bali retreat was everything I hoped for, and more. It was hosted by Tracy, @lisahomsy and @samkat, in the prettiest villa I have ever seen. I was both nervous and excited in the days leading up to the retreat, and was so happy to hear that due to the Balinese holiday ‘Nyepi’, we would all be arriving at the villa a day earlier than planned. Nyepi is the Balinese Day of Silence, and there should be no transportation, work or electricity used on the island. The day is meant for silence, relaxing and reflection, and getting to spend this day getting to know all the amazing women on the retreat was such a fun surprise! We all bonded instantly, and I am so proud to call these women my friends and supporters today. We are all there for each other, and give each other advice, tips and tricks along the way. We even share job leads with each other, and I am forever grateful to Pangea Dreams for creating this community. The workshops during the retreat were great, and covered topics such as personal branding, reaching out to hotels, Lightroom editing, creating a media kit and photography. The latter was a particular godsend, as I had a fancy camera that I had been using on automatic for over 6 months! Sam taught amazing workshops on understanding the settings, how to shoot in manual, and how to compose the perfect photo! I now proudly shoot in manual only, and know exactly what I am talking about when I discuss the camera settings or the lighting situation I am shooting in! Furthermore, I was really hoping to perfect my Instagram feed. I felt like it was missing something, and I couldn’t really figure out what that was. So Sam had me round up some of my favourite Instagram photos, and proceeded to tell me EXACTLY what I should be doing with my camera settings and editing in order to achieve my ‘dream look’. My Instagram feed after the retreat! In addition to the workshops, we spent lots of time playing with our new camera skills by shooting each other, staging professional photoshoots and having our photos taken by our in-house photographer Sam. I left the retreat with so much content, and was in awe at how many amazing, professional photos I now had of myself and the group. It’s been 2 months since the retreat and I still haven’t posted all the photos! Seriously, I would have had to pay a professional photographer thousands of dollars for that, and I couldn’t believe all the value I left the retreat with. We spent time exploring Bali, and were introduced to the hosts’ favourite places. I am now hooked on taro lattes and coconut ice cream, and know that I have to make my way back to Bali pretty soon in order to get my fix. DId you know that we are heading back to Bali? JOIN US IN OCTOBER! The most incredible day, as agreed by everyone I believe, was the day that started with the sunrise hike to Mount Batur. 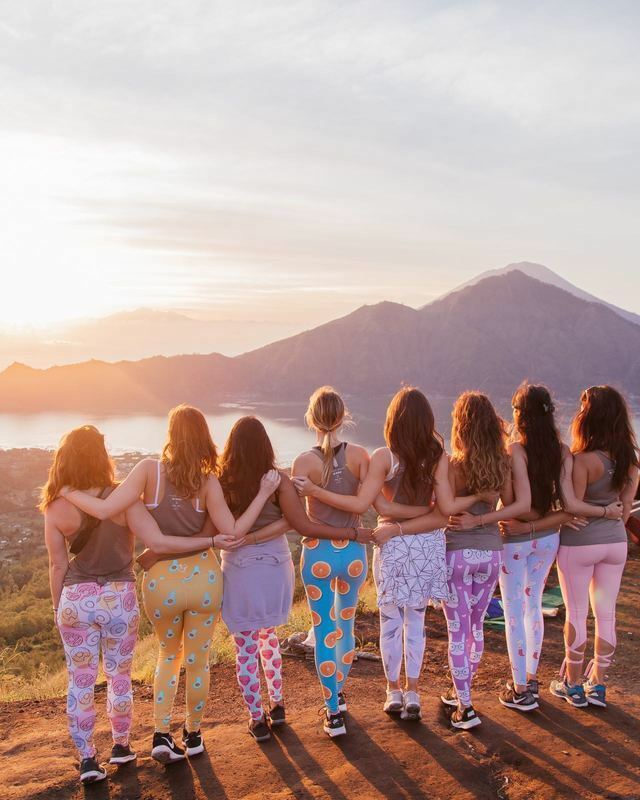 I wasn’t particularly looking forward to the 2am wakeup call (I left my 9-5 claiming that I would never set an alarm for the rest of my life), but once we were all geared up in our new leggings (the goodie bags were amazing!) and ready to go, it wasn’t as bad as I had expected. The hike up the volcano was challenging and incredibly special. I have never before hiked in the dark, seeing only what the flashlights could show us, and it was a unique experience. We supported and pushed each other, and when standing at the top with these girls I knew that the experience had brought us so much closer. When we got down from the mountain, it was time to head to an experience that I was very much looking forward to. The Kamandalu had invited us all to their Presidential Suite for the day, and were even preparing their Insta-famous floating breakfast! Seeing the pool of the suite for the first time was incredible, as this was a place I had been eyeing on Instagram for so long. The day didn’t end there, and after our incredible time at the Kamandalu it was time to see the rice terraces that Bali are so known for. This meant another costume change and more photo shoots, and by the time we were back at our villa we were exhausted and giddy with all the amazing experiences from the day. In short, the Pangea Dreams retreat changed my life in so many ways. I really got to hone in on my skills and take my content creation and photography to the next level. I met and connected with inspiring women who I will forever call my friends, and I can’t believe how easily we all bonded in just a week. That really is some of the magic of Pangea Dreams. After the retreat I feel so much more confident in everything I do, much because I now have a whole safety net of women who support me and understand my struggles better than anyone else. My new media kit looks epic, and I am really proud to send it out to brands I want to work with, as opposed to feeling scared and nervous as I did before the retreat. I have seen the efforts my favourite Instagrammers put into their feeds, and now truly understand what it means to be an influencer! If anyone is considering the retreat, I couldn’t urge you enough to just do it! I never regretted the investment, and left the retreat knowing that the value I was taking with me was worth 10 times the cost of the retreat! I would do it again in a heartbeat. Lisa is a 27-year-old travel blogger & content creator from the beautiful fjords of Norway. She is happiest when enjoying a glass of wine on the beach, and is determined to never grow up. She believes that through constant exploring and by staying curious this is possible, and vows to stay young at heart forever. Her motto is ‘stay young, keep moving’. She shares her adventures on Instagram and her blog; Fjords and Beaches.